Despite the fact that it is present in almost all vertebrate species, very little was known about the habenula until fairly recently. In the past several years, however, the habenula has received a significant amount of attention for its potential role in both cognition (e.g. reward processing) and disorders like depression. Still, the habenula remains a little-known structure whose functions are yet to be fully elucidated. The habenula is part of the diencephalon and, together with the pineal gland, makes up a structure called the epithalamus. The pineal gland is found on the posterior side of the thalamus and is attached to the diencephalon by a stalk. At the base of that stalk there are two small swellings (one on each side); these are the habenulae. The habenula is traditionally divided into a lateral and medial section. What is the habenula and what does it do? The habenula receives information from the limbic system and basal ganglia through a fiber bundle called the stria medullaris. It sends information to areas of the midbrain that are involved in dopamine release, such as the substantia nigra and ventral tegmental area. 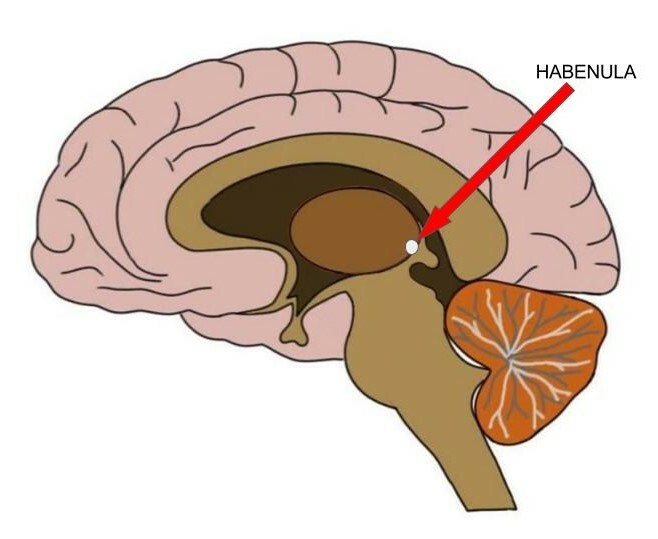 The habenula also has neurons that project to areas like the raphe nuclei, which are involved in serotonin release. Thus, the habenula is one of the few known structures in the brain that can exert an influence over large populations of both serotonergic and dopaminergic neurons. Dopamine and dopamine-rich areas of the brain like the substantia nigra and ventral tegmental area are thought to be important to processing information related to rewards. When we receive a reward--which could be anything from a slice of cheesecake to a line of cocaine--there is corresponding dopamine activity that seems to be associated with how satisfying we expect the reward to be. If the reward is larger than we expected (e.g. a big slice of cheesecake, topped with syrup and with a side of ice cream), our dopamine neurons get excited with activity that seems to help us remember the details of how we obtained the reward. In this way, our dopamine system helps us to recall how to get the reward again. When this encoding of the details associated with a reward becomes hyperactive, it can result in the obsessive reward-seeking we see in addiction. But when the reward is smaller than we expected (e.g. a few crumbs of cheesecake on an otherwise empty plate), dopamine activity in the substantia nigra and ventral tegmental area is inhibited. Smaller-than-expected rewards, however, cause increased activity in the habenula, while larger rewards lead to an inhibition of activity there. Thus, it has been hypothesized that the habenula is involved in encoding information about disappointing (or missing) rewards. The habenula has also been found to be activated in response to punishment (e.g. electric shocks) and stimuli that we have previously associated with negative experiences. Based on all of this information, it is thought the habenula plays an important role in learning from aversive experiences and in making decisions so as to avoid such unpleasant experiences in the future. The habenula has been found to be activated in response to stress, and so it may not be surprising--given the strong relationship between chronic stress and depression--that the habenula is suspected to be involved in the pathophysiology of depression. Habenular neurons are hyperactive in depression; some have suggested this activity may correspond with an increased propensity toward pessimism. Structural abnormalities of the habenula have been found in the brains of patients who suffered from major depressive disorder, and in one case a patient who was not responsive to typical treatments for depression did respond to deep-brain stimulation of her lateral habenula. Regardless, although there are some indications of habenular involvement in depression, the association between the habenula and depression is still unclear. More research will be needed to determine if there is a causative link, and if so what the nature of that link is. The habenula also seems to play a role in sleep. It has mutual connections with the pineal gland, which secretes melatonin--a hormone important for regulating circadian rhythms and promoting sleep. There is also some evidence that the habenula itself produces melatonin. Lesioning the habenula in experimental animals results in a disruption of rapid eye movement (REM) sleep, and thus the habenula may have role in both promoting sleep and sleep quality. Some have suggested the role of the habenula in sleep may also be related to its role in depression, as depressed individuals often suffer from sleep disorders. The functions of the habenula are just beginning to be understood. Until fairly recently, our neuroimaging techniques were not even powerful enough to visualize the habenula with adequate resolution. Now that this has changed, the tiny structure is becoming recognized as an important part of the brain. The next decade is likely to reveal some interesting new data about just how important this once-obscure brain region really is.